As a child, Betty Bloomer aspired to become a ballet dancer. After high school, she attended dance school, and earned an audition with the legendary Martha Graham. She briefly performed with Graham's dance troupe, then worked as a model and married a furniture salesman, William G. Warren. They divorced five years later, and she soon met Gerald Ford. A year later they married, and two weeks after that Gerald was elected to Congress. Over the course of her husband's long political career, she became more and more outspoken. She publicly supported the Equal Rights Amendment and legalized abortion, long before he did. After 25 years as a Congressman, Gerald Ford had decided he would not run for re-election to Congress, and then Spiro T. Agnew resigned as Vice President, and President Richard M. Nixon asked Ford to become Vice President. As scandal subsequently closed in on Nixon, it soon became clear that Ford would become the first un-elected President of the United States. 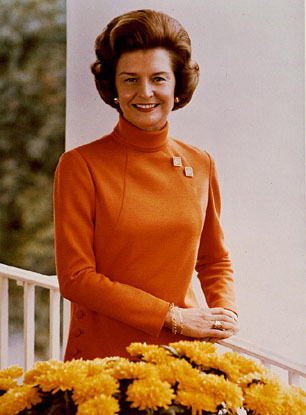 He took the oath of office on 9 August 1974, making Betty Ford the nation's First Lady. A month later she was diagnosed with breast cancer. Instead of keeping her diagnosis quiet, as had been the norm until that time, Ford announced that she would undergo a radical mastectomy surgery. She has said she went public to let women know that breast cancer is a health issue, not something to be embarrassed about. After undergoing her surgery, Ford developed a dependency on painkillers, administered for arthritis and a pinched nerve. Alcoholism also became a problem — cocktail parties had been rare events in the Fords' lives when he was a Congressman, but became commonplace when they were suddenly thrust into the White House. After her husband lost the 1976 election and the White House to Jimmy Carter, she drank heavily, and was later shocked when all four of her adult children returned home one day to stage an "intervention". They told her what she already knew but failed to admit to herself: that she had a problem with pills and alcohol. Ford was admitted to a rehabilitation program at the Long Beach Naval Hospital. Again she was open about something usually hidden, becoming one of the first celebrities to undergo rehab and issue a press release about it. As a result, she received hundreds and hundreds of letters from people who needed help, but didn't know where to get it. Ford began seeking donors to establish a private clinic for dealing with chemical and alcohol addiction. "I really didn't want to have my name on the center", she said, "because it just seemed like it was too much of a personal thing." But as she brought together the center's staff, everyone involved kept telling that her name would help put patients' minds at ease. The Betty Ford Center opened in 1982, and it has helped hundreds of celebrities combat addiction, from Jerry Lee Lewis to Anna Nicole Smith, along with many thousands of ordinary people. "As far as we're concerned", Ford said, "all our patients are stars." For many years she remained very involved in running the clinic, not just as chair and namesake, but also as the center's informal greeter. She would often approach people after they had signed in, give them a warm hug, walk with them for a few minutes, and introduce them to the staff. Many patients, she said, came in carrying a suitcase in one hand, and her autobiography Betty: A Glad Awakening in the other. She was the second divorced woman to become First Lady. The first was Warren G. Harding's wife, Florence. In the 1987 TV movie of her life, Ford was played by Gena Rowlands. She died at the age of 93, in 2011.